News, issues, beliefs both political or social, and anything else relating to our daily lives. In Part II of Black Underworld Inc., the economic repercussions of foreign and American exploitation in Central America has sired many, if not most of our modern illegal immigration-refugee problems at our southern border. Economic indicators over 35-years show substantial income per capita inequality in Texas, the state that makes up half of the southern border as well as one of four states that immigrants-refugees might first enter. The reality is most illegal immigrants enter the U.S. through points-of-entry like airports and seaports, and stay well beyond their visas when here then disappear into the general population. A tiny percentage actually gain entrance through our southern border. According to the U.S. Bureau of Labor Statistics there are five (5) sectors driving the current national economy and have been for many years. Construction and Retail/Service are #3 and #4 respectively. 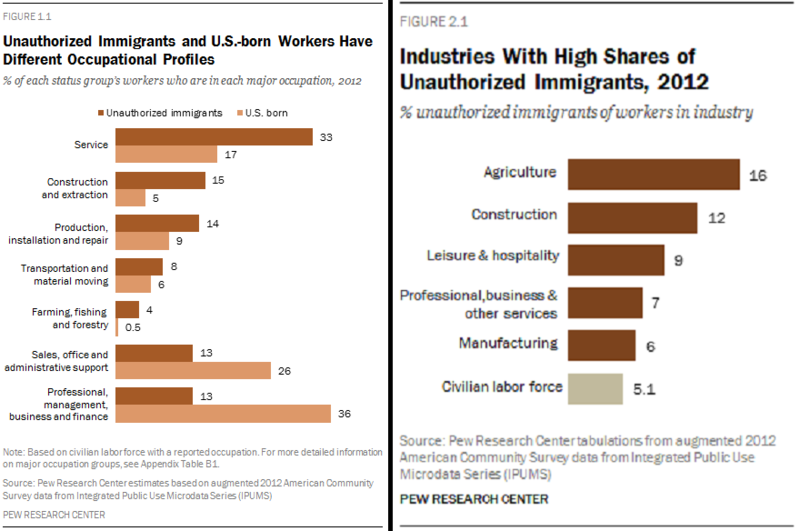 Both of these U.S. industries illegally hire tens of thousands of low-wage workers via contractors, subcontractors, by mid-size and small businesses. Mega-corporations rarely do because they are high profile and therefore utilize buffer methods, or scapegoat contractors. In Texas and the U.S. this unprincipled, illegal labor finessing has become a booming underworld relationship, benefiting America’s upper 10% – 20% along with the mega-corporations or companies they own or are employed by. The fact that the other three big driving GDP sectors of the U.S. economy—healthcare, technology, and non-durable manufacturing—demand highly educated, degreed, sector-specific experienced workers able to garner high wages. This trend has another domino effect. Sparse high-wage jobs channel most U.S. citizens or Texans without the under or post-grad degrees, or impeccable industry-experience into low-wage construction or retail/service occupations once again profiting the upper 1% – 20% of the nation’s population. This in turn contributes to America’s amassing economic inequality and a host of other domestic hardships and unlawful markets. 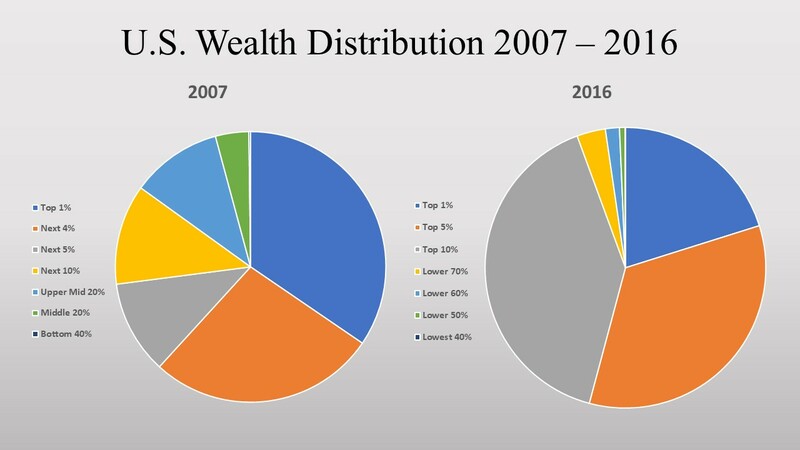 [Those 18 firms hold] 36 percent of all wealth last year, a jump from 27 percent in 2009 with the gap expected to widen further, according to a report from Standard & Poor’s, a New York-based credit rater. That means that out of a record $1.53 trillion in cash and short-term investments held by U.S. corporations the wealthiest 18 held about $535 billion. “In our view, current U.S. corporate tax policy and accommodating credit market conditions have been primarily responsible for this growing wealth gap,” the report said. Furthermore, the wealthiest top 20 percent held 89 percent of total cash, leaving only 11 percent for the bottom 80 percent of firms. The top 1 percent are mostly investment-grade businesses — Microsoft, Google, Cisco, Apple, Oracle, Ford, Coca-Cola and Boeing — and are concentrated in technology and healthcare industries. By utilizing advantages of foreign deposits and other minor investments, these 18 wealthiest corporations mostly or completely avoid their ethical and taxable obligations back home. The corporate analysis shows that the top 1 percent gets about 55 percent of its revenues offshore, and that more than half of the cash flow is generated overseas, as well. That cash is rarely brought onshore because of the U.S.’s 35 percent tax rate, which would be on top of the taxes paid in the country in which the revenue was generated. “As a result, overseas cash continues to accumulate untouched,” the report said. Before stepping into the lethal venomous part of BU Inc., it is critical for readers to fully grasp the gravity of obscured, illegal American labor practices and abuses onto economically average and below-average Texas and U.S. citizens. This cannot exclude exploitation of abundant undocumented workers and the corporate evading of fair, compulsory reinvestment back into our nation’s general well-being via effective statutory tax rates. I am hence obliged to drive home how grim this toxic disparity has become, how misconstrued Americans perceive it and the ulcerating consequences of the American (and Texas) naïvety or shirking of the elephant in the room. In order for a single person to live alone safely and comfortably in 50 of the biggest U.S. cities one must earn (in 2014) an average of $57,879 per annum—in Texas’ seven largest cities it is an average per annum of $50,686 with San Antonio the lowest and Houston the highest, $46,238 and $60,795 respectively. As I noted in Part II, the per capita annual income of Texans in 2017 was only $28,985 for about roughly ±25-million Texans. The American population, according to a 2011 study, of any political persuasion grossly underplays the nation’s true wealth inequality. And so as the elephant of growing severe inequality continues to lounge unimpeded in our room of false patriotic optimism, then the horrors of the darkest parts of BU Inc. here in our own backyard will continue to feast and cannibalize our malnourished middle and lower classes. Essentially, the wealthy possess greater financial opportunities that allow their money to make more money. Earnings from the stock market or mutual funds are reinvested to produce a larger return. Over time, the sum that is invested becomes progressively more substantial. Those who are not wealthy, however, do not have the resources to enhance their opportunities and improve their economic position. Rather, “after debt payments, poor families are constrained to spend the remaining income on items that will not produce wealth and will depreciate over time.” Scholar David B. Grusky notes that “62 percent of households headed by single parents are without savings or other financial assets.” Net indebtedness generally prevents the poor from having any opportunity to accumulate wealth and thereby better their conditions. Whether the abuses and crimes take place on this side of our southern border or just across it in Mexico or clear down to Colombia in South America and everywhere in between—a small part in a enormous picture is not a “crisis” and especially not a national emergency—then we native-born U.S. citizens, our corporations, and our federal and state governments have a major role in how we address, reduce, and cure ourselves of the venom and pestilence we have helped create and sustain. Vague political rhetoric does not make the beast go away. I will probe only five of these tentacles since there is not enough time to probe all fourteen and I could not do each justice and the exposure they deserve in this series. However, if you would like to read brief summaries of the other nine black (tentacle) markets then click here. Following are the five I believe harbor, amplify, and distribute plutocracy, not democracy, increased tyranny and the worst of human trauma and suffering to disadvantaged millions and their families. That in turn rewards the few BU Inc. kings, lords, their associates and spawn. Concluding this 4-part series will be a close up ugly and frightful look into America’s illegal gambling, phony pharma, human trafficking, ghost guns, and the human organ trade. 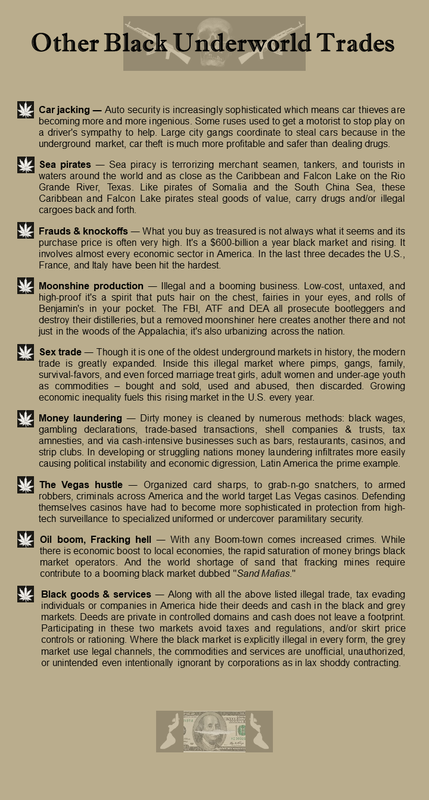 The black byproducts of America’s unlawful corporate grey market. And also in my conclusion I will share some one-on-one personal stories of three homeless people out of ten I spoke with over the last 12-months. Just over a mile away from where I currently live is a part of Dallas called Preston Hollow. Further up a bit is North Dallas where the Dallas North Tollway cuts through on its way to Addison and Frisco, Texas, two suburbs that are some of the wealthiest in the DFW Metroplex. Barely over 1,400 feet from me to the south then east of 75/Central Expressway is a large number of rotating, roaming homeless persons. I met six of them at one nearby convenient store where they often loiter hoping to receive money or food and drink. The other four I met were not too far away either. There I often purchase my car’s gasoline at another convenient store that borders one of our many city public transit rail-stations. In this area are two or three times as many homeless people roaming and loitering for the exact same help. The stark demarcations of haves and have nots within a 2 ½ square mile area is remarkable and curious. I hope you can return to read their personal stories that speak directly to what my BU Inc. series reveals: how and why these underworld markets thrive and who suffers.